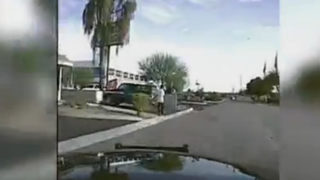 An Arizona police officer is being backed by his chief after he drove his police cruiser into an armed suspect who was walking on the sidewalk, USA Today reports. Marana Police Chief Terry Rozema released footage of the Feb. 19 crash, and the moments leading up to it, this week, according to the news site. Mario Valencia, the suspect, is accused of stealing a rifle from a Wal-Mart, running a home invasion and robbing a convenience store before finally, allegedly, firing a shot at officers with the stolen weapon, according to the site. Officer Michael Rapiejko was prompted to run his car into Valencia after the suspect continued to walk down the sidewalk armed, seemingly refusing to acknowledge officers. “You don’t want to do this! You don’t want to do this!” the officer can be heard in the video apparently shouting at the suspect. Read more at USA Today.